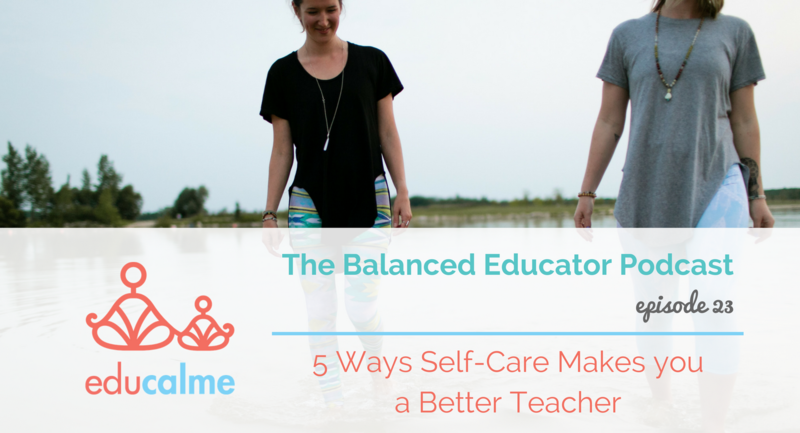 In this episode of The Balanced Educator Podcast, we share why it’s so important to take good care of ourselves as teachers! We chat about why educators should stop feeling guilty about taking time out of their day for self-care. 1 – You’ll feel calmer and this will be reflected in your students. 2 – You’ll have the space to respond rather than react as a teacher. 3 – You’ll become more compassionate with yourself and with your students. 4 – You can’t pour from an empty cup, so when you fill up your cup first it will spill out to your students and you will become the best version of yourself for them. 5 – You’ll learn a toolkit of strategies that you can then share with your students and help them develop a toolkit of strategies. Watch them apply these strategies in their day-to-day and become well-balanced people! We love Keith’s book and we think you will get tons of value from reading it! When you purchase Keith’s book through this link, we will receive a commission for referring you at no extra cost to you. How cool is that? We share what we love, you benefit from an awesome book and a portion of the sales helps to support our podcast. Read The Whole Brain Child by Dr. Dan Siegel to learn all about mirror neurons and so much more. We recommend this book for anyone who has kiddos in their lives, it’s influenced our classroom management style immensely! Listen to episode 3, The Fill Your Cup First Experiment to learn all about filling your own cup first (#5 on our list) and ways you can do this. Next: Next post: TBE #025: EDUCALME TEACHER: Why we created this summer course and who it’s ideal for. Registration is open!